Strong metal alloy for maximum performance. 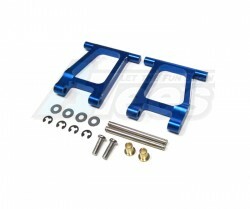 Add strength, toughness and power to your Tamiya TT-01. The Tamiya TT-01 Aluminum Rear Lower Arm With Shims + Collars + E-Clips + Pins + Screws 1 Pair Set Blue has an average rating of stars based on 74 customer reviews. These parts make my tt01 look really good.